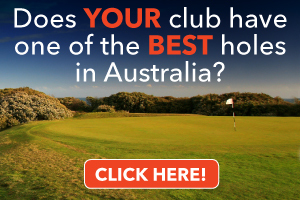 Great golf in Victoria isn’t limited to the Mornington Peninsula or the Sandbelt. 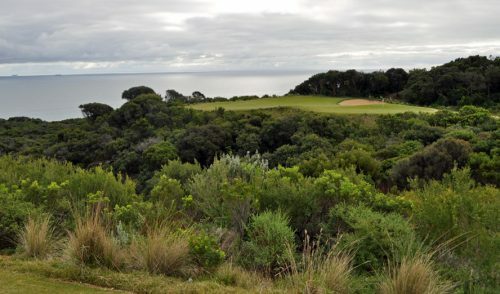 A short trip down the famed Surf Coast offers a variety of challenging and picturesque seaside courses that offer a true test of golf. 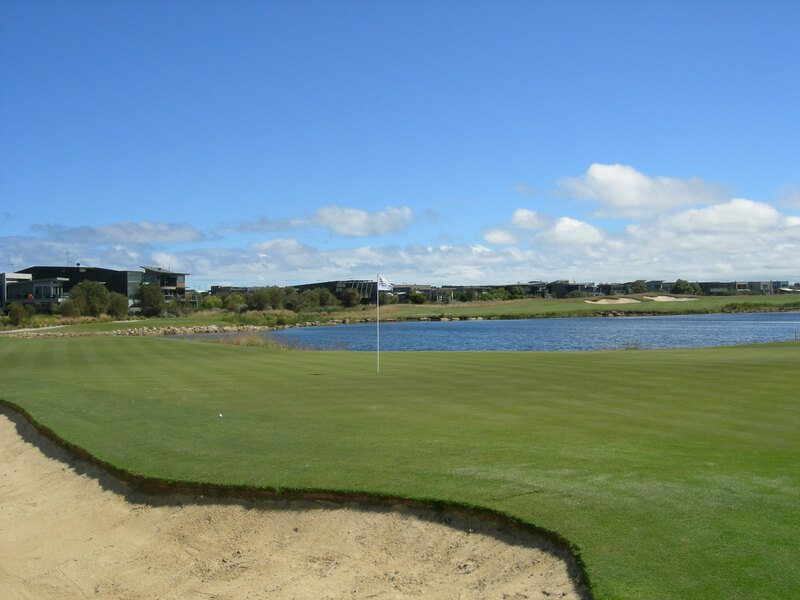 The Stuart Appleby-designed Sands Torquay is one of these courses. 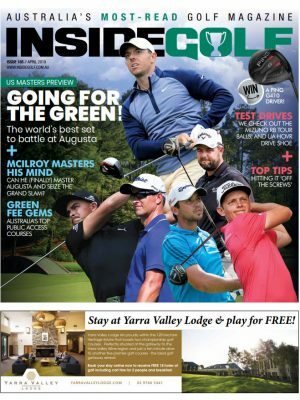 Though still a relatively young course, it has all the hallmarks of a world-class facility, and will no doubt become a favoured destination by social and casual players, as well as those looking for a relaxing getaway in a top-quality resort. The last time I played The Sands — back in 2005 — I walked off the 18th a beaten, battered (and bitter) man. The wind was up, the rain was down, and the sand was everywhere. I mumbled a few silent curses at Stuart Appleby, the weather, and anything else that came into my sight, and vowed that I wouldn’t return until they made significant changes. It took 4 years, plus a recent course mini-makeover, to help me change my mind and make a return. And boy, am I glad I did! 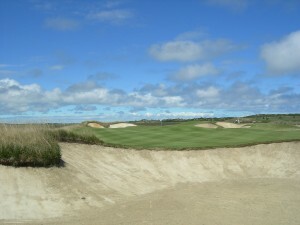 The main challenge of a windy, seaside course like The Sands is being able to manage the course and weather properly. Dry, windswept greens will rarely hold a ball, and no amount of spin can save your approach shot from bouncing off (or rolling through) the green. So the low bump-and-run is usually the best (nay, the only) option. The issue that I (and many others) had with the previous design of The Sands was that many of the holes had massive bunkers both in front of, and behind, the greens — thus preventing ANY shot from finding the dance floor. Same thing for the placement of many of the fairway bunkers — they offered no bail-out areas, and even penalised the smart, under-thewind shots. In essence, the course was a victim of a “Nice design, but in probably the wrong setting” scenario. Fast-forward to today. The recent renovations to the course are spot-on. With many of the extraneous bunkers removed, smart players are now rewarded, the risk-reward players can “go for it”, and the high-handicappers have half a chance at a decent round. The wind, of course, is still a major factor on most days. 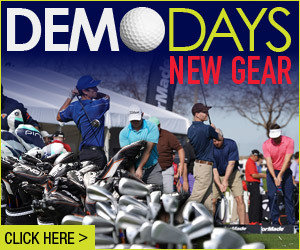 So if you’re uncomfortable playing in windy conditions, it may be best to leave your driver in the bag. Or in the boot. But the course is certainly worth playing. The views throughout the course are magnificent, the greens are firm and true, and the course itself is well manicured and in great condition. Overall, the course has come a long way. 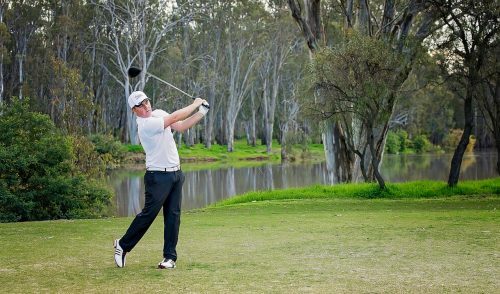 And with the deluxe accommodation at the on-site Peppers Resort, it is a stellar location for a golf holiday, social club weekendaway, or even a full-on membership. When I heard I was heading to Torquay to review The Sands, I was excited enough to tell a few of the regular golfers I know. Expressions like “murderous” and “they don’t call it The Sands for nothing” and “I hope the weather is kind to you” flowed freely. I was clearly not in for a bland experience. So as I approached the first tee at this beautiful course on a mild and relatively still morning I thanked my lucky stars and proceeded to make a meal of my drive, I knew I was in for a challenge, this course takes no prisoners. 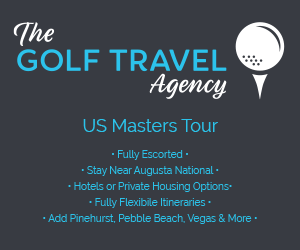 Long (surprisingly lush) fairways, slick greens, hungry rough, and those bunkers! I made the mistake of checking out the course guide before I headed out and spotted what looked to me to be an average of about 7 bunkers per page. On the course, my ball found a ratio of about 1:1 bunker to hole. I certainly got some great sand practice, and by the end of the round I was even starting to avoid the ‘Adolf Hitler’. Even though the course is relatively new it seems they heeded the feedback about the early design and have since filled in a number of the bigger, more dangerous traps off the tee. Comparing the old course guide to the one I played confirmed to me that it is now infinitely more playable while still delivering a great golf challenge to all who take her on. The Sands is a great course, I particularly like the design of each hole, a lot of blind greens and trouble akimbo, but thankfully there are plenty of chances to redeem yourself if you find you’re in trouble off the tee. 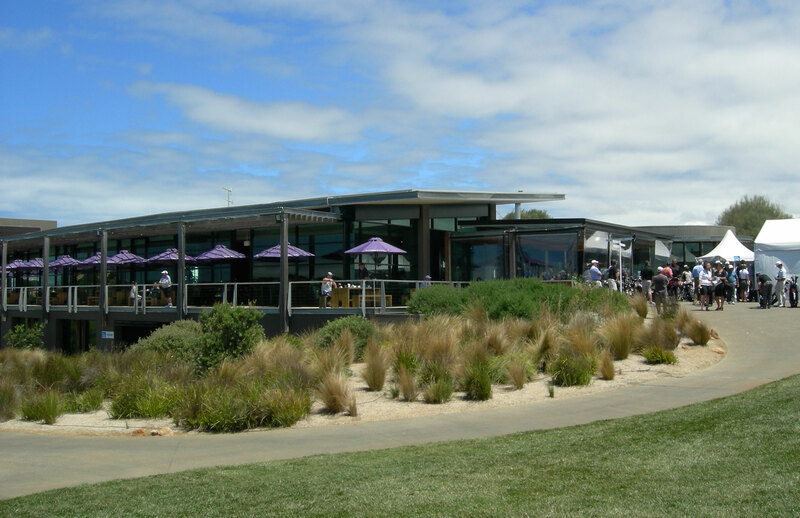 With a huge 5-Star Peppers resort integrated with the first class golfing facilities, a lovely vista on many a turn and one of the Bellarine Peninsula’s most testing but rewarding golf courses, The Sands is a true Australian destination course guaranteed to get you talking. A nicely manicured and quite challenging golf course to really practice your game… not how far you can drive the ball. Whilst it’s always nice to outdrive your mates, being able to hit the ball long on this course comes with quite a few risks. The bunkering and hazards that line most of the fairways don’t lend themselves to wayward tee shots. So if you are not a high percentage fairway hitter, I would probably choose a safer club for your tee shots and take any abuse from your friends that they throw your way. After all, you can always laugh when they put it in the bunker or spray it into the water. 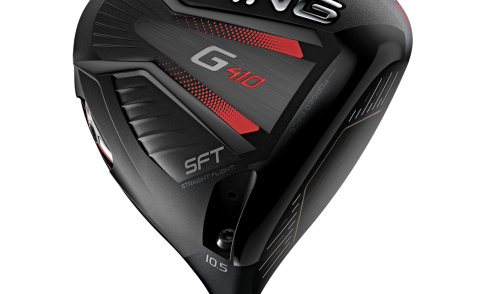 I think I only pulled out my driver 3 or 4 times for the entire round, most holes were played with an iron or hybrid off the tee to steer clear of the nicely positioned bunkers or play down a narrow landing area. I must admit, it did take some control to leave the big driver in the bag when stepping up onto the tee, however because you rarely needed a long iron into the greens, a more conservative style of play will leave you with a nice easy wedge to 8 iron approach shot. Overall the greens were quite heavily bunkered and relatively small which made them challenging to hit, even more so if you were playing from a bunker or the rough. Once on the dance floor though they played as true as any green I have putted on. There were a few grip and rip holes, it was just choosing when to go for your tee shot that was the key. Style of play is definitely the overarching key to playing this course well. Too often I am a golfer that chooses the low percentage glory shots, this course really made me think about my game. It was great having all the challenges there, and learning a different aspect in the game of golf, discipline. Whilst always hard to swallow your medicine on the golf course, being able to do so really helps reduce a potential blowout. The course was challenging yet in the same token, very enjoyable. The wind was not strong when we played however I could tell that with the wind up, the course would play totally different and you can easily add a few shots to your game. A little target golf will help you stay out of trouble and piece together a nice round.